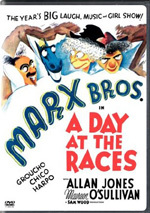 For the Marx Brothers� second big-screen adventure, we head to 1930�s Animal Crackers. In this flick, we start with a party held in the honor of explorer Captain Jeffery Spaulding (Groucho Marx) at the home of Mrs. Rittenhouse (Margaret Dumont). As part of the celebration, �wealthy art patron� Roscoe Chandler (Louis Soren) brings a valuable painting for exhibition. He does so to declare his love for the widowed Mrs. Rittenhouse. Spaulding arrives with his field captain, Horatio Jamison (Zeppo Marx). Hot on his heels, we meet a musician named Signor Emanuel Ravelli (Chico Marx) and his partner �The Professor (Harpo Marx). After the party ends, they prepare for the unveiling of the painting, and two new characters arrive: Mrs. Whitehead (Margaret Irving) and her daughter Grace (Kathryn Reece), part of a prominent family that just returned from Europe. They don�t like the Rittenhouses, so Grace plans to play a trick on them that involves a copy of the famous artwork. Daughter Arabella Rittenhouse (Lillian Roth) doesn�t care for the Whiteheads either, but she�s involved with struggling artist Johnny Parker (Hal Thompson). Groucho woos both Mrs. Rittenhouse and Mrs. Whitehead. Arabella decides to play a painting-related gag that she hopes will advance Johnny�s career. Emanuel and the Professor reveal a secret about Chandler�s past that he wants to keep under wraps. Various other schemes develop. As usual with Marx movies, the plotlines don�t add up to much, as their films use their stories for little more than a loose framework. The flicks live and die by their comedic set pieces. Unfortunately, not much to Crackers soars, and it works as one of the Brothers� lesser efforts. A lot of the problems stem from the inept filmmaking on display. Crackers suffers from a shocking lack of clarity in its photographic elements. The camera often bobs when it moves, displays strange and erratic framing, and can�t quite decide what it wants to show. The composition is often bad, and we actually watch the cameraman struggle to figure out where to settle. It�s a distraction that makes the movie amateurish much of the time. The jerky storytelling doesn�t help. As noted, Marx films usually suffer from weak plots, and that occurs here. The flick flits from one moment to another, usually in search of a gag. When it doesn�t find anything, it flails, and it pushes unnaturally toward the next joke. The editing contributes to the awkwardness, and some bizarre staging also mars the piece. People just stand around and watch while exposition and gags occur. It�s a weird choice to show the crowds as they do nothing while the shtick unfolds. It seems artificial and makes the movie even more off-kilter. Except for the usually reliable Dumont, Marx movies present generally flat supporting characters and weak performances from the secondary participants. These seem worse than usual here, especially due to the insanely broad gestures from Roth. Actually, she becomes inadvertently amusing - her work is so strange that it turns entertaining. The sloppiness even extends to the takes used. On a few occasions, the actors screw up, but God forbid they reshoot those scenes. Nope - we get the blown takes here! The actors usually recover fairly well, but these elements add to the amateurish nature of the flick. On the positive side, Crackers tends to integrate its musical numbers better than usual, as it actually utilizes some of them to tell the story, which is a change from their prior movie, 1929�s The Cocoanuts. Unfortunately, it still grinds to a halt for some of the songs, especially during the inevitable harp solo from Harpo. At least it brings in Chico�s piano number in a more unified manner. Some of the comedy works fairly well. Unfortunately, the problems with editing also mar some of these, as a lot of them just go on too long. For example, the card game meanders and simply doesn�t want to end. Much of the humor lacks the spark that infuses the best Marx work. A decent number of laughs occur, but not enough to redeem all the flaws. I don�t expect a perfect flick from Animal Crackers, as even the best Marx material suffers from significant problems. However, this film is simply too amateurish to be consistently enjoyable. Animal Crackers appears in an aspect ratio of 1.37:1 on this Blu-ray Disc. Despite the movie�s advanced age, this became a pleasing presentation. Sharpness was positive. A few shots showed mild softness, but not to a problematic degree, so the majority of the flick looked pretty well-defined. No issues with jagged edges or shimmering occurred, and I noticed no significant signs of edge enhancement. Blacks fared well. The film showed nicely deep dark tones, and shadows were also fairly clear and well-defined. Print flaws remained absent, and grain seemed fairly natural. Given its age, this was neatly an �A�-level image � it really looked very good. Though not as impressive, the film�s DTS-HD MA monaural soundtrack worked fine for its era. Speech lacked truly natural tones, but the lines were always clear and intelligible. Effects were thin but acceptable. Those elements didn�t have much to do, but they showed adequate accuracy. Music was also limited in range but clear and without distortion. I heard light background noise at times but not to a prominent or distracting degree. Based on its age, this was a satisfying soundtrack. How did the Blu-ray compare to the original DVD from 2004? Audio seemed more natural, as it lacked the DVD�s distortion and noise. Visuals were more concise and substantially cleaner. Everything about the Blu-ray improved upon the lackluster DVD. Because the Blu-ray can be purchased only as part of a three-disc package with one disc partly devoted to bonus materials, I didn�t give Crackers or the other individual discs a grade for extras. I�ll rate the set�s supplements as a whole when I look at that platter. The Crackers disc does come with one extra: an audio commentary from film historian Jeffrey Vance. 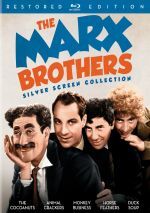 He presents a running, screen-specific look at cast and crew, the stage production and its adaptation, aspects of the Marx Brothers� career, sets/locations, cultural references, cinematic techniques and other movie topics. Overall, Vance delivers a good chat. He touches on all the requisite domains and gets into unusual � but useful � topics like explanations of period allusions that the modern viewer might not understand. This adds up to a solid commentary. 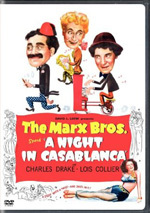 Animal Crackers suffers from all of the problems that affect most Marx Brothers movies and compounds these due to poor movie-making choices. A surprisingly amateurish flick, it includes occasional chuckles but not enough to overcome its flaws. The Blu-ray presents very good picture and sound for a film of this one�s era along with an informative commentary. Too bad the film itself is such an inconsistent piece of work. Note that Universal currently offers Animal Crackers only as part of The Marx Brothers Silver Screen Collection. This three-disc set also includes The Cocoanuts, Monkey Business, Horse Feathers and Duck Soup. The package provides one disc largely devoted to supplements as well.